The Kakum National Park, considered to be Ghana’s premier protected area, covers 350 km2 of moist tropical forest and represents one of the few remaining areas in West Africa's Upper Guinean Forest biodiversity hotspot with most of its plants and animals relatively intact. The park contains isolated populations of several globally endangered species, including the forest elephant, estimated to be 150-245 individuals. Kakum also contains the headwaters of four major rivers that supply water to over 500,000 people. Available data indicates there to be around 80 farming communities with an estimated 2,000 households within a five kilometre radius of the park, that typically maintain about four to eight acres of cocoa farms. The creation of the park restricted its use and limited the area available for crop production, thus adversely affecting the livelihoods of fringe communities. Traditional production practices that were deeply rooted in the culture of the communities were no longer entertained within the landscape because of the perceived threats to the park. During this period, Conservation Alliance, an environmental organization, implemented an initiative that demonstrated the livelihood benefits of integrating biological and cultural diversity within the landscape. Traditional practices including adherence to taboos and norms (dedication of forest to deities, protection of certain animals as totems and reverence of rivers as homes of gods) were integrated into the landscape management plan to strengthen the management of the park and thus enhance the health of the ecosystem. As a means of diversifying sources of incomes without compromising the resilience of the ecosystem, certified cocoa production that is compatible with nature was promoted. Additionally, the communities took advantage of the ecotourism development of the park to embark on economic ventures such as art and crafts production, catering services, tour guiding and performance in cultural troops. The park attracts more than 300,000 visitors to its canopy walkway annually and thus makes Kakum one of the iconic destinations for nature-culture lovers in Africa. Human-elephant conflict mitigation measures were integrated into the ecotourism program to provide additional revenue for impacted communities. Festivals are celebrated annually to deepen the cordial relationship between the people and their environment. The quantity and quality of biodiversity depends on the presence of cultural diversity. As a means of safeguarding their livelihoods against any potential threats, such as the escalating rate of biodiversity loss, rural communities have devised different mechanisms to protect the integrity of the natural resources. Traditional ethics (norms, precepts, principles and taboos) have been adopted to efficiently regulate the conduct and actions of community members towards the use and management of natural resources (Binlinla, Voinov & Oduro 2014; Udokang 2014; Harich et al. 2013; Ntiamoa-Baidu 1995). Tradition and customs defined the various aspects of human behaviour and social activities that were approved and those that were prohibited and forbidden. Nearly all the codes of morality were in the form of prohibitions, which were sanctioned by the deities and ancestral spirits (Udokang 2014). Adherence to these traditional practices was meant to ensure the long-term conservation of natural resources and safeguard economic security. These practices were later reinforced by the adoption of the protected area approach to natural resource management by offering enhanced protection to areas of exceptional socio-cultural, ecological and economic value (West, Igoe & Brockington 2006). This approach provided a landscape perspective to natural resource management and added benefits to landscapes with varying levels of human alterations (Wu 2013; Millenium Ecosystem Assessment 2010; Stolton & Dudley 2010). As a way of providing additional goods and services to humans, some landscapes, such as agro-based ones, have been modified and managed to provide efficient services (Fahrig et al. 2011; Swinton et al. 2007; Robertson & Swinton 2005). The consequences of such management changes were alterations to land, forests and species distribution (Millenium Ecosystem Assessment 2010). Even though the resultant ecosystem may be conducive to a few species, the majority of these species, some rare and of higher conservation importance, may not have been able to withstand these alterations (Robertson & Swinton 2005; Swinton et al. 2007) and may have been lost eventually. Additionally, the intensification of agriculture had led to the degradation of a number of ecosystems goods and services, and thereby reducing the capacities of these goods and services to positively impact agriculture. (Wratten et al. 2013; Nelson et al. 2009; Tscharntke et al. 2005). Agriculture is the most dominant land use within the forest landscape of Ghana and is likely to remain so as the country’s population and food demand rise. As a managed ecosystem, agriculture requires some ecosystem services in order to be productive (Heal & Small 2002). The extent to which agro-landscapes are able to sustain production depends on the management practices that are implemented (Sabatier et al. 2014) and the relationship with the diversity, composition, and functioning of the remaining natural ecosystems in the landscape (Sabatier, Doyen & Tichit 2014; Karanth & DeFries 2010). This suggests that successful management of landscapes includes a human factor (Karanth & DeFries 2010), which should not be ignored in the determination of the sustainability of the landscapes (Bastian, Krönert & Lipský 2006; Estrada-Carmona et al. 2014). Past interventions have yielded limited positive impacts. This is partly because these initiatives were driven by international policies that did not tie in with local values and processes, and thus became unsustainable. In the absence of sustainable management practices, numerous disservices could arise including pest infestation, habitat and species loss, and nutrient loading that may adversely affect farm productivity (Ma & Swinton 2011; Swinton et al. 2007; Zhang et al. 2007). Cocoa production is a major land use and economic activity within the forest areas in Ghana. The Kakum Conservation Area (KCA) is one of the cocoa growing landscapes in Ghana (Marfo 2008). It includes the Kakum National Park (KNP), the Assin Attandanso Reserve (AAR) and an adjourning buffer zone all covering an area of about 420 km2 (Figure 1). The area is part of the Upper Guinean Hotspot in West Africa described as one of the world’s biodiversity hotspots (Barej et al. 2014). It contains isolated populations of several globally endangered species, including the forest elephant, estimated to total 150-245 individuals (Conservation International 1998). Designated a reserve in the 1930s (Eggert, Eggert & Woodruff 2003), the area is not only rich in biodiversity, but also exhibits climatic conditions (temperature range: 20.2 to 31.6 oC; two rainy seasons) that are an additional attraction for the migration of people into the area (Binlinla, Voinov & Oduro 2014). The park also contains the headwaters of four major rivers that supply water to over 500,000 people. Four traditional areas border the conservation area. These are the Assin, Twifo-Hemang, Denkyira (5o20’- 5o40’ N), and Abura-Asebu Kwamankese (1o15’ – 1o30’) traditional areas (Amoah & Wiafe 2012; Binlinla, Voinov & Oduro 2014). Available data indicated that there were around 80 farming communities with an estimated 2,000 households within a five kilometre radius of the area. Each household typically maintains bout four to eight acres (one acre is equivalent to 0.405 hectares) of cocoa and two to three acres of food crops (Marfo 2008; Conservation International 1998). The entire landscape used to be part of the wildlife habitat until a portion of it was carved out for human settlements and agriculture. The traditional authorities instituted certain norms and practices to regulate the use of natural resources and secure the long-term sustainability of agricultural production. The designation of the Kakum Conservation Area sparked a number of socio-cultural, economic and environmental challenges. The traditional production practices that were deeply rooted in the culture of the communities were no longer entertained within the landscape because of perceived threats to the park. These restrictions came into effect after a change in the management regime of the Kakum Conservation Area in 1989 (Yeboah, Deikumah & Henaku-Owusu 2008) from the Forest Services Division to the Wildlife Division (Binlinla, Voinov & Oduro 2014; Fiagbomeh & Bürger-Arndt 2015). Until the change in management regime, the locals supplemented their livelihood needs with hunting (Amoah & Wiafe 2012) and harvesting of non-timber forest products (NTFPs) from the forests (Binlinla, Voinov & Oduro 2014). Restricted access to the forests thus adversely affected the livelihoods of the vast majority of the community members, especially women who depended on the harvesting of NTFPs. Even though the passage of the Wildlife Reserves Regulations (LI 1525) and the 2014 Wildlife Resources Management Bill gave limited user rights to communities, it was not enough to change their economic fortunes (Binlinla, Voinov & Oduro 2014). Cocoa production, the major economic activity within the area, significantly declined due to a number of factors including unavailability of agricultural lands, poor soil, aged cocoa trees and an aging farming population (Cocoa Research Insitute of Ghana 2006; Zeitlin & Teal 2006). An estimated 80% of all youth within the fringe communities migrated to urban centres to look for new economic opportunities (Asamoah et al. 2013; Ghana Statistical Service & Ghana Demographic Health Survey 2008; Zeitlin & Teal 2006). With an increasing population, declining farm productivity and land degradation within the Kakum Conservation Area, a need arose to develop and implement an agricultural system that would enhance the livelihoods of fringe communities without compromising the environmental integrity of the area. Promotion of economic incentives for adoption of sustainable cocoa production practices. CA maintains a documentation system to monitor the ecological health of the agro-landscape and the livelihoods of people living in the fringe communities. This system is a web-based database system with offline capabilities for collecting, storing, and analyzing information in the Kakum Landscape Project. This system stores both socioeconomic and biophysical information from the farm level to the communal and landscape levels. This information was used in assessing the impacts of the intervention. Additional data was collected and compared with the baseline. Since the data collection was a joint exercise between the technical team and the farmers, it offered both parties the opportunity to assess the performance of the project. To complement the biodiversity data analysis, the team also acquired images from the Global Forest Change website. Each dataset downloaded contained information on tree canopy cover, cover loss and gain, unusable data mask, year of gross forest cover loss event, and circa year data that are reference cloud-free Landsat® 7 composite images. All these datasets are offered for the years 2000-2014 and were used to develop a land cover map for the study area. Interventions involved the promotion of best practices in cocoa agroforestry alongside the harmonious co-existence of humans and wildlife within the production landscape. With technical support from the Cocoa Research Institute of Ghana (CRIG), the project team established a modified form of Farmer Field School (FFS) to offer training to beneficiary farmers within the landscape. Braun et al. (2006) described FFS as experience learning aimed at empowering communities to build their capacity for informed decision-making. The training integrated best cultural practices such as the recognition of rivers as deities, as well as the scientific practice of leaving a buffer near rivers to prevent pollution and siltation. The reverence for some tree species within the landscape as “homes” of ancestral gods provided the opportunity to promote the integration of tree cultivation with cocoa production. In collaboration with Ghana’s Wildlife Division (Forestry Commission), the team also promoted the adoption of human-elephant conflict (HEC) mitigation measures to reduce the incidence of elephant crop raiding on farms and ensure peaceful co-existence. The community HEC scout provided technical support services to farmers whose farms were the target of rampaging elephants in exchange for monetary payments. As a means of improving farmer income and ensuring the long-term financial sustainability of the project, the team engaged a licenced cocoa buyer, Olam Ghana Ltd, and a certification body, Rainforest Alliance, to support the production and purchase of certified cocoa. Under certified cocoa production, farmers were required to comply with defined environmental, social and economic protocols to qualify for cash premiums. Additionally, the communities have taken advantage of ecotourism development in the park to embark on economic ventures such as art and crafts production, catering services, tour guiding and cultural performance. The park attracts more than 300,000 visitors to its canopy walkway annually and thus makes Kakum one of the iconic destinations for nature-culture lovers in Africa. There is evidence to suggest that patronage of these various activities has improved the local economy substantially and increased the income levels of the participants by 30% (Marfo 2008). Festivals were celebrated annually to deepen the cordial relationship between the people and their environment. The improvement in the local economy has led to a significant reduction in the direct dependence on forest resources, resulting in marked improvement in the level of biodiversity within the landscape. Generally, the project recorded significant improvement in the ecological health of the landscape and the local economy. The landscape consisted of crop fields, fallow lands, secondary (community) forests and sacred groves (Binlinla, Voinov & Oduro 2014). The tree species within the secondary forests were similar to that obtained from the park, although the diversity and distribution of trees were much lower than the park. The dominant tree species within the secondary forest were Terminalia superba (Ofram), Terminalia ivoriensis (Emire), Pericopsis elata (Kokrodua), Albizia lebbeck (Lebbek tree), Mansonia altissima (Mansonia), Tectona grandis (Teak) and Cedrella ordorata (Cedrella). Similar trends were observed for faunal species too. Wiafe and Sam (2014) reported increased activities of forest elephants, duikers, monkeys, reptiles, butterflies, ants and bees within the secondary forest and cultivated fields within the landscape. Except for the forest elephant, the secondary forests had similar species as those in the protected forest but with less diversity, density and distribution. While the biodiversity of the park was much higher than that of the neighbouring landscape dominated by cocoa, the complex agroforestry system provided a useful substitute for the natural forest. Some writers have revealed that “complex agroforestry systems may be a poor substitute for the natural forest but the heterogeneous mosaic landscape in which complex agroforestry forms part can be strategically managed to maximize the benefits of both sustainable agriculture production and conservation of plant diversity” (Asase & Tetteh 2010, p. 2). The implementation of the project activities sought to reduce the ecological imbalance between the forest and the neighbouring landscape. The development of a database with information on farmers and farms provided a reliable means of decision-making based on production trends. The various outputs from the database gave farmers, their facilitators, and other stakeholders the opportunity to assess the impacts of the intervention at the landscape level. Information in the database was made available to the farmers through the farm map, which is a visual spatial representation the farm (Figure 2). The farm map shows the configuration of the farm, its size, location in relation to other farms, existence of cocoa trees and native plant species that serve as shade for the cocoa trees, and other special features (e.g. animal activity on the farm, presence of sensitive habitats). Production levels of farms were also recorded in the sales record book kept by the Purchasing Clerk. This record included information on cocoa beans (in kg) sold to the Purchasing Clerk over a period. By this, the trends in sales per farmer were established and the amount paid to the farmers was also monitored. Decisions at the landscape level were made based on land cover change analysis of data collected from secondary sources, spatial sources and primary data that was aggregated from the farm level to the landscape level. The buffer area around the KCA exhibited a variable land cover character, primarily because of the less regulated land use types common there. Three major non-forest types of use were identified. These were tree crop plantations that formed the majority (67%) of the cover type, food crop farms and built-up surfaces. The major tree crops grown in the area are cocoa, covering about 45% of the buffer area, oil palm (30%), citrus (15%), rubber and teak (10%). These figures correspond to the number of people engaged in various economic activities that were identified and documented (Figure 3). Change analysis of time series data indicated a conversion of oil palm and citrus plantations to cocoa due to the attractiveness of the crop and the attention given to it by the government. Also, there has been a decline in the local demand for citrus, which has left the crop to be purchased at low prices by brokers who feed the fruit to factories in neighbouring Cote d’Ivoire (Marfo 2008). A mosaic of tree crop agroforests interspaced with fallow lands and food crop farms was observed in the adjourning buffer of KCA. This is a characteristic feature of most agro-landscapes in the High Forest Zone (HFZ) of Ghana (Aneani et al. 2011). Even though food crops are basically for subsistence, surplus food is sold to major cities and at roadside markets on the main Cape Coast-Accra and Cape Coast-Kumasi highways (Awotwe-Pratt & Osei-Owusu 2012). The distribution and extent of food crop farms are influenced by a number of factors (Osei-Owusu, Awotwe-Pratt & Osei-Owusu 2012). Analysis of monitoring data collected by CA (2008) indicated that the distribution and size of farms had reduced considerably over the years. Some farmers attributed this to land scarcity in the conservation area, which had compelled some farmers to reduce the size of their food crop farms and increase the size of their cocoa farms. Their argument was based on the fact that the output of a cocoa farm is higher than a comparable food crop farm. Also, farmers in communities around the northern portions of the area (Assin side) preferred to cultivate cocoa as compared to other crops (Danquah & Oppong 2007). Cocoa farms were less attractive to the elephants that raided farms compared to food crops like plantain and cassava. In the absence of food crops, however, the elephants had diverted their attention to cocoa pods. By promoting best practices in regenerative and resource-conserving technologies and practices that reduce over-dependence on agrochemicals, the project improved farmer income and the quality of the environment. To achieve this, CA together with CRIG and other partners developed a comprehensive curriculum on sustainable cocoa production in the area. The curriculum was organized into modules that depicted the whole lifecycle of cocoa production, from nursery establishment, care for young cocoa trees, shade management, integrated crop and pest management, and post-harvest quality assurance issues. Other modules on biodiversity conservation, financial literacy, and record keeping were added to give the training scheme a holistic view to cocoa production. About 350 lead farmers from 17 communities (Table 1) were enrolled in the modified farmer field school to build their capacity in sustainable cocoa production practices. They subsequently served as trainers for the rest of the farmers within the beneficiary communities. Each FFS-trained lead farmer was given the responsibility to set up a number of farmer field schools and conduct trainings for the farmers within his/her community. An average of seven other farmers were trained by each graduate of the FFS, despite an average of three being forecasted (Table 2). About 2,500 people have been reached with this cascading approach. There was a remarkable increase in farmers’ knowledge in sustainable cocoa production, from an initial two out of ten farmers in 2002 to eight out of ten farmers in 2016 (Conservation Alliance 2016). This demonstrates the positive impacts of the project since its inception. Analysis of information collated from the field indicated that there was an increase in the number of trees per unit area of cocoa farm. A change analysis using the Global Forest Change tool (Hansen et al. 2013) indicated that a contiguous secondary-like forest has been formed along the boundaries of the KCA where cocoa is cultivated. According to the farmers, there are growing incentives—both financial and socio-cultural—for them to propagate, nurture, and/or protect species in and around their farms. Some of the cultivated trees include Terminalia superba (Ofram), Terminalia ivoriensis (Emire), Pericopsis elata (Kokrodua), Triplochiton scleroxylon (Wawa), Milicia excelsa (Odum) and Piptadenia africana (Dahoma). This is mostly the case in areas where CA introduced cocoa certification projects that required farmers to have at least eight species of indigenous trees per acre of cocoa, including Terminalia superba, Terminalia ivorensis, Newbouldia laevis, Milicia excelsa, Persea americana, Ficus exasperata, Antiaris toxicaria, Amphimas pterocarpoides, Albizia zygia and Morinda lucida. Shade trees on the cocoa farms helped to regulate the incidence of pests such as capsids and improved the ecological health of the farms. The SDM initiative augmented past government efforts (the CODAPEC and Cocoa Hi-Tech schemes) and resulted in an approximate 30% increase in farm productivity. This initiative, implemented in 2016, contributed to a significant improvement in the health of the ecosystems and livelihoods of fringe communities, reflected in the yield per acre of the cocoa farms of beneficiary community members (Figure 4). In consultation with the farmer leadership, CA also assisted farmers in the adoption of UTZ Certified and Rainforest Alliance certification standards at various sections of the KCA. Farmers that were certified under these schemes witnessed an increase in their incomes from the sale of produce and from cash premiums paid for being certified. The improved local economy (from sustainable cocoa production and ecotourism) contributed to a significant reduction in the direct dependence of the locals on forest resources especially the NTFPs (Marfo 2008). Similarly, the level of biodiversity within the landscape increased, evidenced by the increased number of wild animals that were sighted on farms. While the project succeeded in reducing the direct threats posed by agricultural encroachment, it could not completely eliminate illegal hunting within the landscape. Most of the illegal activities were carried out by non-residents and sometimes faciliated by residents. The project recorded significant improvement in the health of the ecosystem and the income of households through the implementation of the different interventions. The farm database provided an excellent tool for farmers to accurately predict crop production trends. Estimates made by farmers were based on appropriate measurements of their farms allowing for the appropriate application of farm inputs and estimation of labor for farm activities. This reduced the cost of inputs that farmers needed to invest per year and also the amount of time the farmers used in the implementation of these practices. Farmers were therefore able to budget for ensuing years and also predict yields, ultimately determining the incomes that were available to farming families. Data was the key here, and the ability of farmers to turn data into information and apply it to their farms was enhanced. For farmers to have optimal success in adopting best practices in cocoa production, training approaches and methodology should be built on the traditional knowledge systems that the farmers perceive as useful and easy to adopt. Training modules did not only look at the production systems but also covered aspects of financial literacy and management that gave farmers appropriate control of their production and investment. Farmers were then able to better plan farm activities resulting in increased yields and transformation of livelihoods. The payment of cash premiums for sustainable production of cocoa did not only promote the improved ecological health of cocoa farms but was an incentive for adoption of sustainable practices. Farmers were motivated to adopt improved practices to increase yield and earn higher cash premiums for their produce. This was a win-win situation for the environment and livelihoods of the farmers and their families. The significant improvement in cocoa yield (about 30%) and the corresponding returns from certification (150-350 USD /ton) largely accounted for the wide-scale adoption of the recommended actions. The ease of accessing technical support from CA’s field staff also motivated the farmers to sign on to the initiative. Some of the youth (about 12%) who had abandoned cocoa farming returned to take advantage of the opportunities that the initiative offered. While ecotourism was not the focus of the SDM initiative, the provision of services by community members to tourists accounted for about 11% of the household income in 2015 (Conservation Alliance 2016). Admittedly, this may appear low, but there was evidence to suggest that this figure will go up in the future due to the favourable political climate and the significant improvement of the level of biodiversity that attracts nature lovers to the site. Cocoa production is undertaken by about 800,000 farmers and their families in Ghana. This makes cocoa production an important livelihood support pathway for most rural communities in the HFZ of Ghana. The Kakum Conservation Area project presented a good opportunity to support the argument that communities are willing to take part in conservation efforts if they understand the linkages between their livelihoods and the landscapes in which they live. Constant engagement with farmers and their families in the form of investments into the provision of improved and alternative livelihood options for fringe communities continued to sustain the local economy and promoted the sustainable use of natural resources in the area. Engagement was based on the fact that behavioral change is gradual and should be done without compromising the traditional knowledge system that exists in the area. There is an ongoing need for continuous engagement of farmers to sustain the gains made with the implementation of innovative activities that aimed at promoting farmer livelihoods and the ecological health of their farms. We acknowledge the funding support from Satoyama Development Mechanism (SDM) without which the project could not have been implemented. We also put on record our gratitude to the farmers especially those who offered their farms for demonstration. We thank the staff of Cocoa Research Institute of Ghana who provided the technical support during the implementation of the Farmer Field School. We also thank the Wildlife Division of the Forestry Commission for collaborating with the project team in the generation of data. Finally, we thank all the CA field team, without whose support the project would have failed to achieve the recorded outcomes. 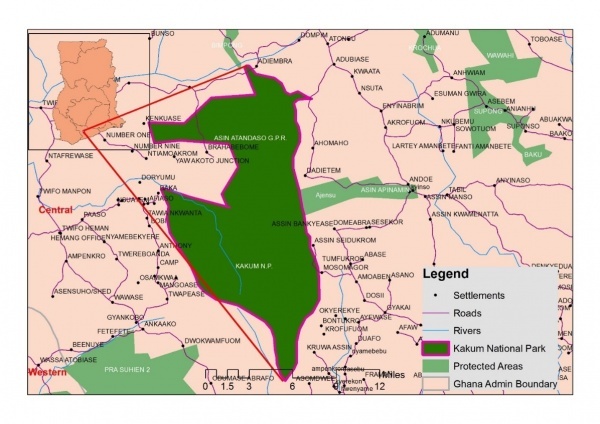 Amoah, M & Wiafe, ED 2012, ‘Livelihoods of fringe communities and the impacts on the management of conservation area: the case of Kakum National Park in Ghana’, International Forestry Review, vol. 14, no. 2, pp. 131–144. Aneani, F, Anchirinah, VM, Owusu-Ansah, F & Asamoah, M 2011, ‘An analysis of the extent and determinants of crop diversification by cocoa (Theobroma cacao) farmers in Ghana’, African Journal of Agricultural Research, vol. 6, no. 18, pp. 4277–4287. Asamoah, M, Owusu-Ansah, F, Anchirinah, VM, Aneani, F & Agyapong, D 2013, ‘Insight into the Standard of Living of Ghanaian Cocoa Farmers’, Greener Journal of Agricultural Sciences, vol. 3, no. 5, pp. 363–370. Asase, A & Tetteh DA 2010, ‘The role of complex agroforestry systems in the conservation of forest tree diversity and structure in southeastern Ghana’, Agroforestry Systems, vol. 79, no. 3, pp. 355-368. Barej, MF, Schmitz, A, Günther, R, Loader, SP, Mahlow, K & Rödel, M 2014, ‘The first endemic West African vertebrate family – a new anuran family highlighting the uniqueness of the Upper Guinean biodiversity hotspot’, Frontiers in zoology, vol. 11, no. 1, p. 8,. Viewed on 14th June, 2017 Available at: http://www.frontiersinzoology.com/content/11/1/8/abstract. Bastian, O, Krönert, R & Lipský, Z 2006, ‘Landscape diagnosis on different space and time scales – A challenge for landscape planning’, Landscape Ecology, vol. 21, no. 3, pp. 359–374. Binlinla, JK, Voinov, A & Oduro, W 2014, ‘Analysis of human activities in and around protected areas (PAs): Case of Kakum conservation area in Ghana’, International Journal of Biodiversity and Conservation, vol. 6, no. 7, pp. 541–554,. Viewed on 14th June, 2017 Available at: http://www.academicjournals.org/journal/IJBC/article-abstract/3486BB746206. Braun, A, Jiggins, J, Röling, N, van den Berg, H & Snijders, P 2006, A Global Survey and Review of Farmer Field School Experiences, Report Prepared for the International Livestock Research Institute (ILRI), Endelea, the Netherlands. Viewed on 19th May, 2017. Available at: http://www.share4dev.info/kb/documents/1880.pdf. Cocoa Research Insitute of Ghana 2006, Ghana Cocoa Production Outlook- 2006, Tafo, Eastern Region. Conservation International 1998, Baseline Data- Sustainable Cocoa Production in the Kakum Conservation Area in the Central Region of Ghana. Danquah, E & Oppong, SK 2007, ‘Phenology of forest trees favoured by elephants in the Kakum Conservation Area, Ghana’, Pachyderm, vol. 42, pp. 43–51. Eggert, LS, Eggert, JA & Woodruff, DS 2003, ‘Estimating population size for elusive animals: the forest elephant of Kakum National Park, Ghana’, Molecular Ecology, vol. 12, no. 6, pp. 1389–1402. Estrada-Carmona, N, Hart, AK, DeClerk, FAJ, Harvey, CA & Milder, JC 2014, ‘Integrated landscape management for agriculture, rural livelihoods, and ecosystem conservation: An assessment of experience from Latin America and the Caribbean’, Landscape and Urban Planning, vol. 129, pp. 1–11. Fahrig, L, Baudry, J, Brotons, L, Burel, FG, Crist, TO, Fuller, RJ, Sirami, C, Siriwardena, GM & Martin, J 2011, ‘Functional landscape heterogeneity and animal biodiversity in agricultural landscapes’, Ecology letters, vol. 14, no. 2, pp. 101–112. Fiagbomeh, RF & Bürger-Arndt, R 2015, ‘Prioritization of strategies for protected area management with local people using the hybrid SWOT-AHP analysis: the case of Kakum conservation area, Ghana’, Management Science Letters, vol. 5, no. 5, pp. 457–470. Ghana Statistical Service & Ghana Demographic Health Survey 2008, Ghana Demographic and Health Survey 2008: Ghana Statistical Service, Ghana Health Service, Ghana AIDS Commission, Available at: http://www.dhsprogram.com/pubs/pdf/FR221/FR221%5B13Aug2012%5D.pdf. Gockowski, J, Asamoah, C, David, S, Gyamfi, I & Kumi, MA 2010, ‘An evaluation of farmer field school induced changes in Ghanaian cocoa production’, Journal of International Agricultural and Extension Education, vol. 17, no. 3, pp. 43–56, Available at: http://www.scopus.com/inward/record.url?eid=2-s2.0-79960746913&partnerID=40&md5=dcd9d3493a8b89348d24d3201a76b47a. Hansen, MC, Potapov, PV, Moore, R, Hancher, M, Turubanova, SA, Tyukavina, A, Thau, D, Stehman, SV, Goetz, SJ, Loveland, TR, Kommareddy, A, Egorov, A, Chini, L, Justice, CO & Townshend, JRG 2013, ‘High-Resolution Global Maps of 21st-Century Forest Cover Change’, Science, vol. 342, no. 6160, pp. 850–853, Available at: http://www.sciencemag.org/cgi/doi/10.1126/science.1244693. Harich, FK, Treydte, AC, Sauerborn, J & Owusu, EH 2013, ‘People and wildlife: Conflicts arising around the Bia Conservation Area in Ghana’, Journal for Nature Conservation, vol. 21, no. 5, pp. 342–349. Heal, GM & Small, AA 2002, ‘Agriculture and ecosystem services’, in Handbook of agricultural economics, Volume 2, eds BL Gardner & GC Rausser, p. 1341. Karanth, KK & DeFries, R 2010, ‘Conservation and management in human-dominated landscapes: case studies from India’, Biological Conservation, vol. 143, no. 12, pp. 2865–2869. Ma, S & Swinton, SM 2011, ‘Valuation of ecosystem services from rural landscapes using agricultural land prices’, Ecological Economics, vol. 70, no. 9, pp. 1649–1659. Marfo, ED 2008, Socio-economic Characteristics of Communities within the 5km Radius of the Kakum Conservation Area, Accra. Millenium Ecosystem Assessment 2010, Ecosystems and Human Well-Being: Biodiversity Synthesis. Nelson, E, Mendoza, G, Regetz, J, Polasky, S, Tallis, H, Cameron, R, Chan, K, Daily, GC, Goldstein, J, Kareiva, PM, Lonsdorf, E, Naidoo, R, Ricketts, TH & Shaw R 2009, ‘Modeling multiple ecosystem services, biodiversity conservation, commodity production, and tradeoffs at landscape scales’, Frontiers in Ecology and the Environment, vol. 7, no. 1, pp. 4–11. Ntiamoa-Baidu, Y 1995, Indigenous vs. introduced biodiversity conservation strategies: the case of protected area systems in Ghana, Biodiversity Support Program. Osei-Owusu, Y, Awotwe-Pratt, V & Osei-Owusu, PK 2012, Characterizing and Mapping the Incidences of Human-Elephant Conflicts Around the Kakum National Park, Accra. Robertson, GP & Swinton, SM 2005, ‘Reconciling agricultural productivity and environmental integrity: a grand challenge for agriculture’, Frontiers in Ecology and the Environment, vol. 3, no. 1, pp. 38–46. Sabatier, R, Doyen, L & Tichit, M 2014, ‘Heterogeneity and the trade-off between ecological and productive functions of agro-landscapes: A model of cattle–bird interactions in a grassland agroecosystem’, Agricultural Systems, vol. 126, pp. 38–49. Stolton, S & Dudley, N 2010, Vital Sites: The Contribution of Protected Areas to Human Health: a Research Report by WWF and Equilibrium Research, WWF. Swinton, SM, Lupi, F, Robertson, GP & Hamilton, SK 2007, ‘Ecosystem services and agriculture: Cultivating agricultural ecosystems for diverse benefits’, Ecological Economics, vol. 64, no. 2, pp. 245–252. Tscharntke, T, Klein, AM, Kruess, A, Steffan-Dewenter, I & Thies, C 2005, ‘Landscape perspectives on agricultural intensification and biodiversity–ecosystem service management’, Ecology letters, vol. 8, no. 8, pp. 857–874. Udokang, EJ 2014, ‘Traditional ethics and social order: A study in African philosophy’, Cross-Cultural Communication, vol. 10, no. 6, p. 266. West, P, Igoe, J & Brockington, D 2006, ‘Parks and peoples: the social impact of protected areas’, Annu. Rev. Anthropol., vol. 35, pp. 251–277. Wiafe, ED & Sam, MK 2014, ‘Evaluation of a low-tech method, pepper–grease, for combatting elephant crop-raiding activities in Kakum Conservation Area, Ghana’, Pachyderm, vol. 55, pp. 38-42. Wratten, SD, Sandhu, H, Cullen, R & Costanza, R (eds) 2013, Ecosystem services in agricultural and urban landscapes, Wiley Online Library. Wu, J 2013, ‘Landscape sustainability science: ecosystem services and human well-being in changing landscapes’, Landscape Ecology, vol. 28, no. 6, pp. 999–1023. Yeboah, S, Deikumah, JP & Henaku-Owusu, E 2008, ‘The Status of Three Species of Turacos in the Kakum Conservation Area in the Central Region, Ghana’, West African Journal of Applied Ecology, vol. 13, pp. 143–151. Zeitlin, A & Teal, F 2006, Ghana Cocoa Farmers Survey 2004: Report to Ghana Cocoa Board, Centre for the Study of African Economies University of Oxford UK. Zhang, W, Ricketts, TH, Kremen, C, Carney, K & Swinton, SM 2007, ‘Ecosystem services and dis-services to agriculture’, Ecological Economics, vol. 64, no. 2, pp. 253–260.